Background story about what this nominated executive has achieved since January 1 2017. The impact he has had in his role and the industry. Focus on specific accomplishments and relate these accomplishments to past performance or industry norms. Mehul Agarwal, a 32-year-old, global business development, customer success and tech start-up mentor have extensive experience in variety of areas, including: B2B, B2C, operational efficiency, Management Analysis, commercial revenue, strategic partnerships amongst others. He is the recipient of “CEO’s Award for Sales Excellence” in the year 2016, for building one of the largest customer account worth $45 Mil from a cold call in merely three years for one of his previous companies he has worked with. In this year itself he has built new business of over $5.5 Million alone that’s not only is profitable but also generated a lot of new jobs not to forget his previous years contributions that also generated jobs globally. 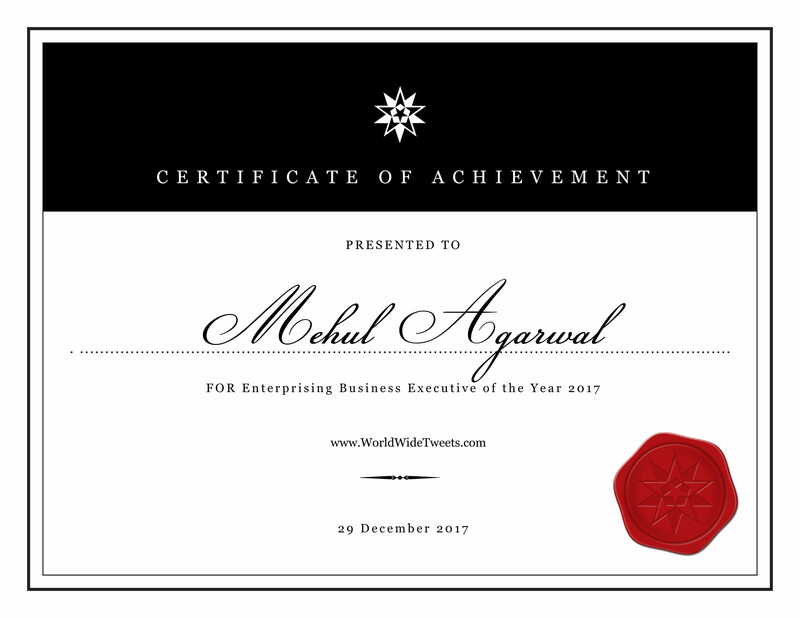 Furthermore, Mehul has been blessed with a wonderful career in business, he also dedicates his time in helping others realize their dreams of owning and scaling their own small successful business. He now mentors’ international tech start-ups to build sustainable businesses. One of his very recent business mentorship experiences involved in mentoring Scooterino around global business expansion strategy that won the prize in an accelerator. It was one of the only 9 companies that won the $100K and that helped them fast tracked their venture to the new level of going global. He also launched a podcast under the name GrowthRun where talks about various challenges in building businesses and how to overcome some of the more common challenges along with guests who are very highly regarded business executives, startup founders and entrepreneurs. We are delighted to present him the award for Enterprising Business Executive of the Year 2017. He also commented that he’d like to create or be involved in a product in the future for the healthcare and life sciences industry.